We got up just before 7 and got showered and ready. We went upstairs to our hosts rooms for breakfast. The old woman was in her dressing gown looking slightly scary. Her husband had gone to “recherche la pain”. We sat and waited in their very brown room with fabulous views over the hills. A small and enthusiastic dog came in and started licking the sunscreen off my leg. The woman took it away. Bread, croissants and jams arrived. I moved what I thought was my cereal bowl to one side and the bloke came back and filled it with coffee. The room was filled with slightly bad art. Someone in the family liked to paint. There were photos everywhere, including one of JPII in his Popemobile. We ate then the chap filled our bidons, breaking one of Lou’s. The ride out of town was fabulous, all downhill to St Jodard, a cheery village, and on to our first view of the Loire. It’s huge and there’s miles to go. It’s also cut itself a route out of the rock, but the road is up and down through some pretty major hills. I spotted a castle as we cycled downhill. 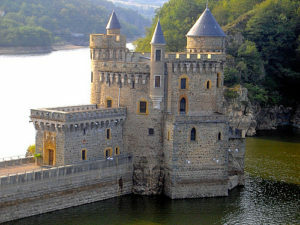 A fabulous chateau in the middle of the river. We stopped to look and chat about what it would be like to live there. Then we began to climb the hills way above the river. We pedaled on, higher and higher. At one stage I started counting pedal revolutions – 50 and I could stop for a drink, then 40, then 30, then 25. It was harsh. I was glad it was still morning and cool, but we still had a strong headwind against us. A fabulous descent and more climbing – we were at peak one of five. At one stage where the road was a sharp V shape on the map I had to give up and push the bike around the worst bit of a hairpin as mad dogs behind a fence barked at me. Finally, past Bully at the top we spotted a sundial from the guidebook. There was a hotel so we stopped for coffee. The waiter was old and seemed to be dressed only in boxer shorts. He was keen to point out places we should visit. A super-duper descent, against the wind, down to the hydro electric plant. It was really cool. The great big river squirted through a tiny pipe. We waited for the sun to break through so we could see rainbows in the spray. After scoffing Fruisli bars we headed off along a track beside the river which took us to Roanne.